In 1962 the Optical Manufacturers Association adopted the boxing system to provide a standard for frame and lens measurement that greatly improved upon the accuracy of previous systems. 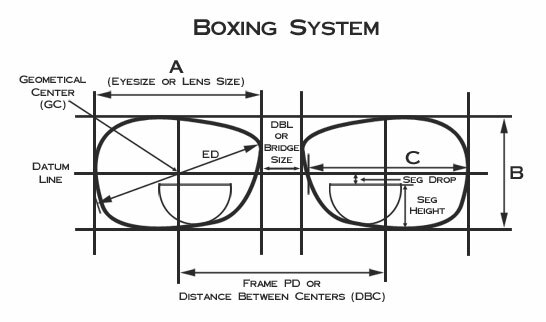 The boxing system is based upon the idea of drawing an imaginary box around a lens shape with the box's sides tangent to the outer most edges of the shape. The system uses the sides of the boxes as reference points for the standard system of measurements. "A" Measurement - The horizontal distance between the furthest temporal and nasal edges of the lens shape or the distance between the vertical sides of the box. The A measurement is also commonly known as the eyesize. "B" Measurement - The vertical distance between the furthest top and bottom edges of the lens shape or the distance between the horizontal sides of the box. Datum Line - The horizontal line that runs through the vertical center of the frame. Geometric Center (GC) - The intersection of the Datum Line and horizontal centers of each lens shape. Distance Between Lenses (DBL) - The shortest distance between the nasal edges of each lens or the distance between boxes. DBL is also commonly referred to as bridge size. Distance Between Centers (DBC) - The horizontal distance between the geometric centers of the lenses. DBC is also know as the Geometric Center Distance (GCD), but more commonly referred to as the frame PD. In theory the DBC can be calculated by adding the "A" Measurement to the DBL as marked on the frame, however in practice the calculation may differ from the actual measurement. Note: Frames are typically marked for size, for example: 54-18, where 54 is the "A" Measurement and 18 is the DBL. Effective Diameter (ED) - Twice the distance from the geometric center of the lens furthest edge of the lens shape. The ED can also be defined as the smallest diameter lens that would cutout, if the frame's geometric center matched the lenses optical center. ED is used in combination with decentration distance to select the minimum lens blank size required to fit a given frame. Temple Length (OTL) - The running distance between the middle of the center barrel screw hole and the end of the temple. Length to Bend (LTB) - The distance between the center of the barrel and the middle of the temple bend. Front to Bend (FTB) - The distance between the plane of the front of the frame and the temple bend. Used if there is a significant distance between the frame front and the beginning of the temple.